Carl W. Rettenmeyer (February 10, 1931 – April 9, 2009) was born in Meriden, Connecticut, to his parents Frederick and Gertrude; he had one sister and a brother. He first met his wife Marian (May 28, 1930 – November 19, 2017) in 1951, and married her in 1954. She had been interested in insects from an early age and Rettenmeyer “knew she was a woman I had to keep track of”; she would become his lifelong assistant. Together they raised a son and a daughter. Carl attended Swarthmore College; as an undergraduate, he majored in Biology, graduating in 1953. In his junior year, Rettenmeyer was contacted by Theodore Schneirla, an acquaintance of his biology professor. Schneirla was studying the behavior of army ants and needed an assistant to work for six months on Barro Colorado Island (BCI) in Panama. Rettenmeyer accepted that field position, and he and Schneirla spent many nights observing army ant trails. It was at this time that Rettenmeyer first noticed that other animals lived on the ants – a subject that continued to fascinate him throughout his life. After graduating with a B.A. in 1953, Rettenmeyer studied for a PhD in entomology at the University of Kansas under the supervision of Charles Duncan Michener; he received his doctorate in 1962. During his PhD studies, Life magazine approached him and asked him to accompany a photographer to BCI to locate army ants. Rettenmeyer said that this was his “lucky break,” and during nine weeks spent on BCI he collected thousands of specimens, including 147 species of mite found living on the ants. Upon his return to Kansas he was encouraged by faculty members to apply for funding so he could return to study army ants in the rainforest. Throughout his career he went on over 20 expeditions to Panama, Ecuador and Costa Rica. He was one of the first biologists to visit Monteverde Cloud Forest Reserve in Costa Rica, which is now a major center for Neotropical research. Rettenmeyer began his professional career at Kansas State University, teaching there from 1960 to 1971, and was promoted to Associate Professor in 1965. In 1971, he was hired by the University of Connecticut, where he stayed until he retired in 1996. At UConn, he taught General Ecology, Ecology and the Environment, Photography for Biologists, and Social Insects at the undergraduate level and Invertebrate Behavior at the graduate level. He supervised 9 Ph.D. and 6 M.S. students. A highlight of Rettenmeyer’s career was the establishment of the Connecticut State Museum of Natural History, on the campus of the University of Connecticut in Storrs. The museum opened in 1985, with Rettenmeyer as Founding Director, a position he held concurrently with his faculty appointment until his retirement. Rettenmeyer studied a broad range of topics related to army ants, publishing on general army ant biology, chemical communication and foraging behavior. His work also inspired other researchers to investigate such diverse areas as avian ecology, social insect symbioses, tropical phenology and conservation biology. He presented at many conferences and published over 50 papers during his career. In 1963, Rettenmeyer rediscovered the army ant Neivamyrmex sumichrasti, which was first described by François Sumichrast in the 1860s but then not studied further. 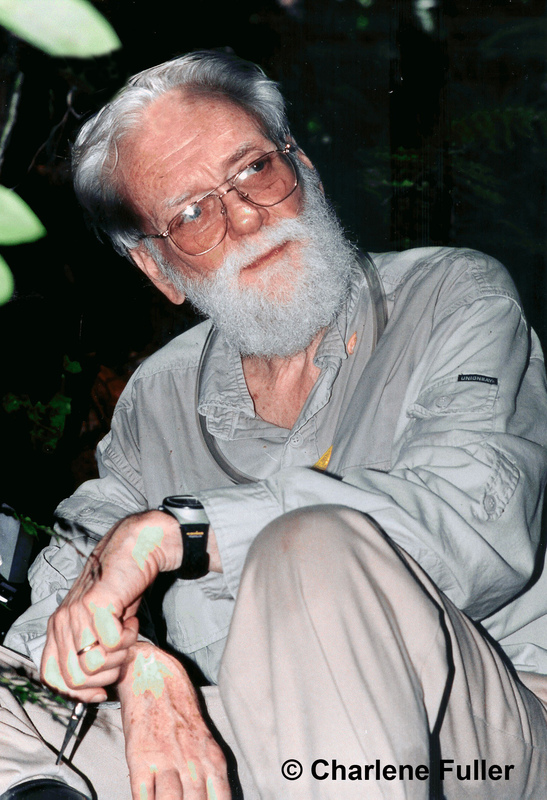 In 2003, he helped another expedition find the species again, and also tried to find a species of beetle associated with it. However, Ecitosius robustus, the Robust Army Ant Beetle, is almost impossible to distinguish physically from the host ant, and Rettenmeyer was unable to find it among the samples collected. In 1975, Rettenmeyer and his student recorded the first case of mass recruitment in army ants. They found that when worker ants encounter a food source that is too large for them to kill or carry, they communicate with other workers via chemical and physical signals to recruit them to assist. Throughout his career Carl worked with his wife. Marian had completed her undergraduate studies at Ohio Wesleyan University and obtained her Master’s Degree in Biology from University of Michigan. She was a research assistant at University of Kansas. Together they identified 557 species of animals associated with Eciton burchellii, the greatest number of animals known to associate with any single animal species. Although many of the associations are likely to be opportunistic, over 300 species are thought to be reliant on the ant to survive. A careful, thorough field biologist, Rettenmeyer collected many thousands of specimens that have not yet been identified. He spent his later years examining samples from 1200 army ant colonies he had collected and in total found 45,000 mites. Only a small percentage of these mites have been studied; of these, three new mite families were identified and described, as well as over 100 new species. Some of these mites have inconceivably strange lifestyles. One species (Macrocheles rettenmeyeri) only lives on the feet of one particular species of ant (Eciton dulcius) acting like an extension to the foot, while sucking the blood of the ant. This was regarded by E. O. Wilson and Bert Hölldobler as the most extraordinary parasitic adaptation among ant parasites. Another mite only lives on the eye of another species, and Rettenmeyerius carli lives on the base of worker’s mandibles. Scientists are continuing to study the specimens Rettenmeyer collected during his life and one researcher told the BBC that she expected that the number of associated species could potentially double once the work is completed. After his death a set of papers on army ants was published in Insectes Sociaux (volume 58) in memory of his work. In addition to his research accomplishments, Rettenmeyer was well known for his photography of army ants and especially for his ability to photograph previously unseen aspects of army ant behavior. He was the first to photograph army ants mating. Rettenmeyer’s photographs appeared in over 100 publications, including National Geographic magazine, the Encyclopedia of Animal Life by the Audubon Society, Smithsonian magazine, and several books. He used his extensive video footage to compose two one hour videos summarizing the biology of the ants themselves and their associates (see “Videos” link below).